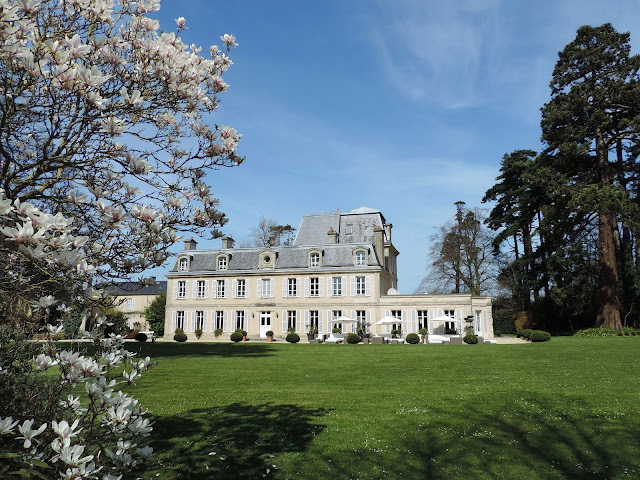 Standing proudly at the end of a long, tree lined drive, nestled in almost 30 acres of lush green lawns and sheltered by an array of magnificent cedar trees, lies the beautiful Chateau la Cheneviere. A magnificent 18th century property that feels more like something out of a painting or a film set, than real life. Think Downton Abbey, in France, but less stiff and miserable. Perfectly located between the little fishing village of Port-en-Bessin and the historic town of Bayeaux (famous for its tapestry and close to Normandy's D Day Landing Beaches) this bubble of rural tranquility is close enough to civilisation that you can cycle into town for dinner or walk down to the seafront, but if you leave your bedroom window open, the only thing you'll hear will be the sound of singing birds (and maybe the odd seagull squawk). 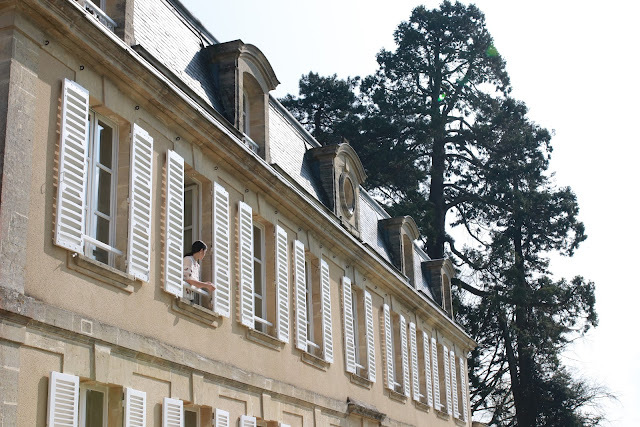 Despite feeling worlds away from any kind of city life, this grand country house is only a 2 hour train journey from Paris, making it my idea of a perfect country retreat. I must admit that for me, as someone who has a limited attention span and enjoys constant stimulation, anything less than an activity-packed city break was a hard sell... but I'm utterly converted. I felt almost as if I'd been pleasantly sedated - like a part of my brain had been put on pause. Take me back at once. Chateau la Cheneviere is part of the 'Small Luxury Hotels of The World' group - who boast a 520 strong portfolio of boutique hotels and resorts, and the amenities at la Cheneviere rival that of many much larger hotels. There are both laundry and room services, as well as parking, two restaurants, a swimming pool, fitness centre, a 36 hole golf course, tennis court, a spa, bikes, free wifi (essential in order to brag to everyone about how amazing your holiday is so far) and if that all wasn't enough, the hotel has its very own speakeasy cellar bar - Zanzibar, complete with a calvados based cocktail menu and decorated with fascinating souvenirs picked up by the Chateau's owner on his travels. The bedrooms are spacious, elegant and airy. They're decorated in a charming (but certainly not stuffy) traditional manner with all of the modern accessories you could possibly need. In fact the shower in my bathroom made my shower at home look like a sponge bath. The staff were delightful, endlessly helpful and seemed genuinely happy to be there. The atmosphere of the house is like nowhere I've ever visited; it felt like coming home to somewhere I'd never been. This is a place that is loved, and you can tell. 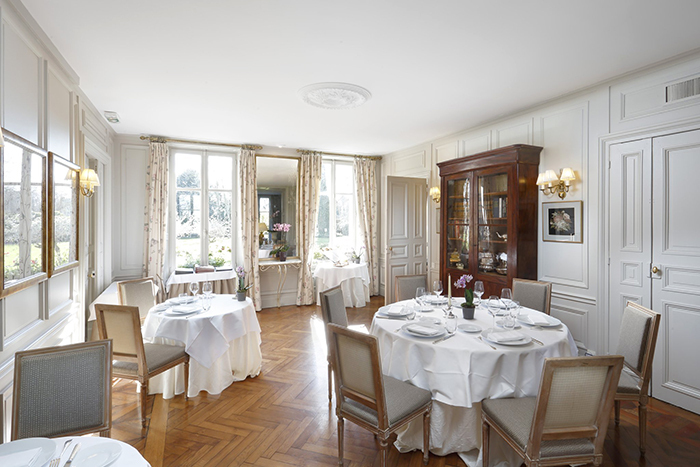 For dinner, we ate in what is surely one of Chateau la Cheneviere's shining attractions, Le Botaniste restaurant. 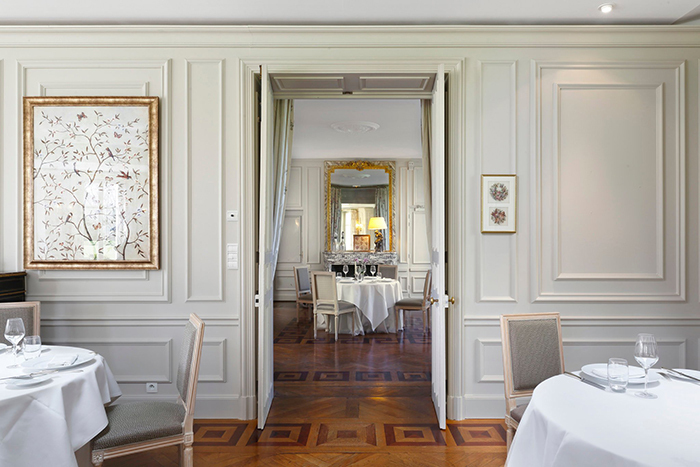 The restaurant itself seems opulent, yet intimate. It's grand and impressive but feels as if you and the other tables are all part of a friend's lavish dinner party. The chef, Didier Robin creates his regionally inspired, contemporary dishes based on local produce, with many ingredients being grown in the chateau's very own vegetable garden (I particularly enjoyed the fresh rhubarb!). The sommelier is also on hand to help select wines from the cellar, to compliment the culinary delights of Le Botaniste. For our dinner at Le Botaniste, we started with a Chenevière cocktail which consists of pommeau, peach cream and champagne on ice (which I have since recreated at home and sipped in bed like a grand old lady of the manor). Then, I had scallops with Shiitake mushrooms, wild garlic, kale soup and roasted linseed, followed by 'Le Trou Normand'; an apple sorbet with Calvados and Pommeau foam on top to give it a little something extra. 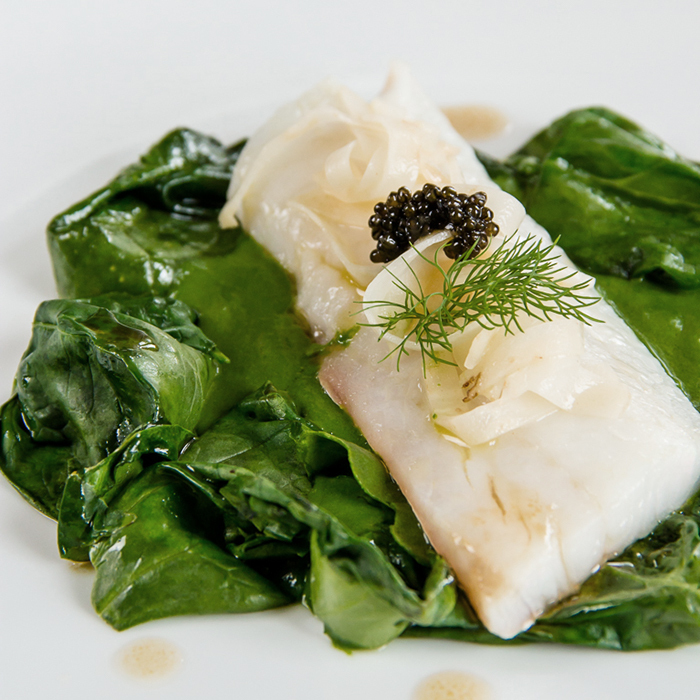 For my main course, I had the whiting fish with black pearl caviar served with spinach and celeriac tagliatelles, followed by what is referred to as 'The Chariot of Cheese'. I am a fan of cheese at the best of times but when it's presented to me on a chariot, I am in ecstasy. From the marvellous chariot (as seen above) we selected an array of cheese accompanied by a delicious sweet chilli jam. For dessert, I had the caramelised apple tart tatin with pommeau and farmhouse butter, vanilla crumble, tonka beans and caramel ice cream with salted butter. I have to tell you, from the moment I ate the amuse-bouche (and the amuse-bouche of my neighbouring friend, there is no stopping me) I announced that the food already rivalled that of my family's beloved favourite Belmond Le Manoir aux Quat'Saisons and its two-Michelin starred restaurant. By the end of the meal, I was even more sure of it. The food at Le Botaniste was absolutely spectacular and in my opinion, easily equalled, if not surpassed many Michelin starred venues I've dined in across the world. 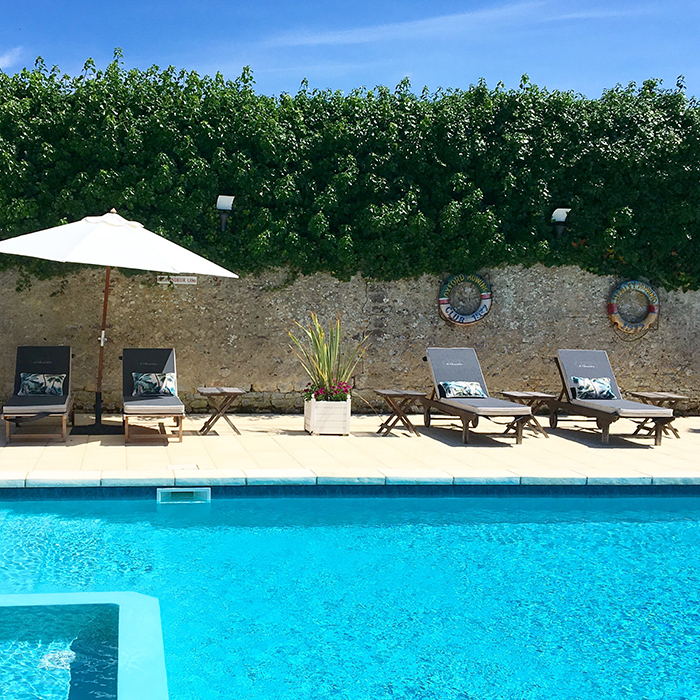 I could go on and on, but in summary - would I recommend Chateau la Cheneviere? Absolutely. Aggressively!! Would I return? Absolutely, and I will make sure of it. You can see more of everything seen here including a room tour and dinner at Chateau La Cheneviere's restaurant Le Botaniste. Penhaligon's, the luxury British perfumers have been creating masterpieces through fragrance since 1870. Hammam Bouquet is one of their oldest and most iconic fragrances, created by Mr Penhaligon in 1872 and inspired by the Turkish Baths of Jermyn Street in Mayfair. Now, the once masculine fragrance has been reimagined for modern day in the form of Savoy Steam - and this time, it's an aromatic scent for both sexes. Penhaligons' new offering comes in two forms; a slightly stronger eau de parfum and a more delicate eau de cologne. 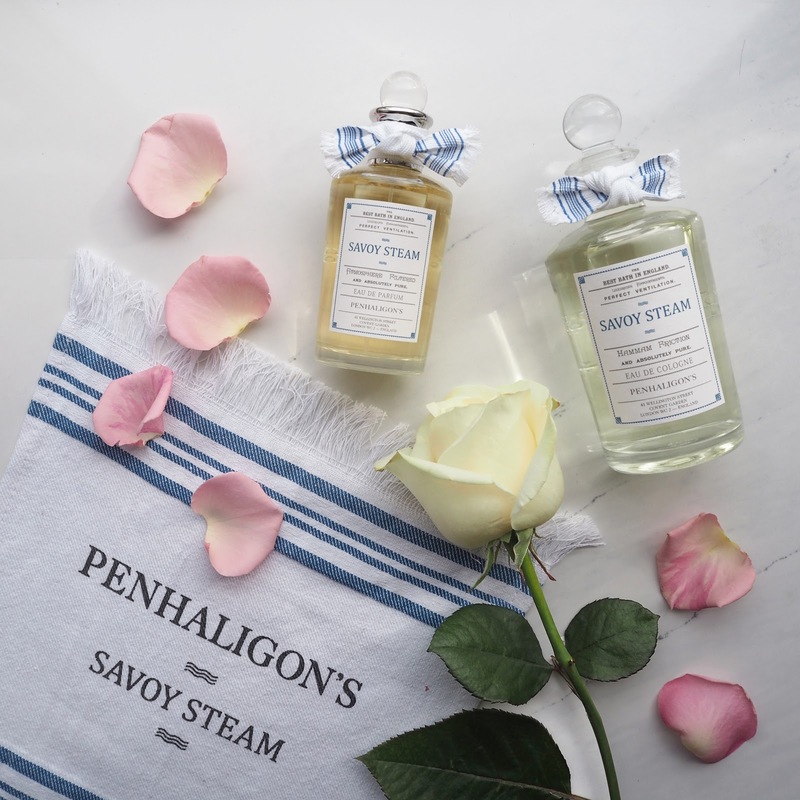 Of course, the classic Penhaligon's packaging features in both new additions, with a nod to the scent's bathhouse heritage in the form of a little towelling bow. The head notes: Rosemary Oil Tunisia and Pink Pepper. The heart notes: Rose Essential and Geranium Absolute. The base notes; Incense resinoid. 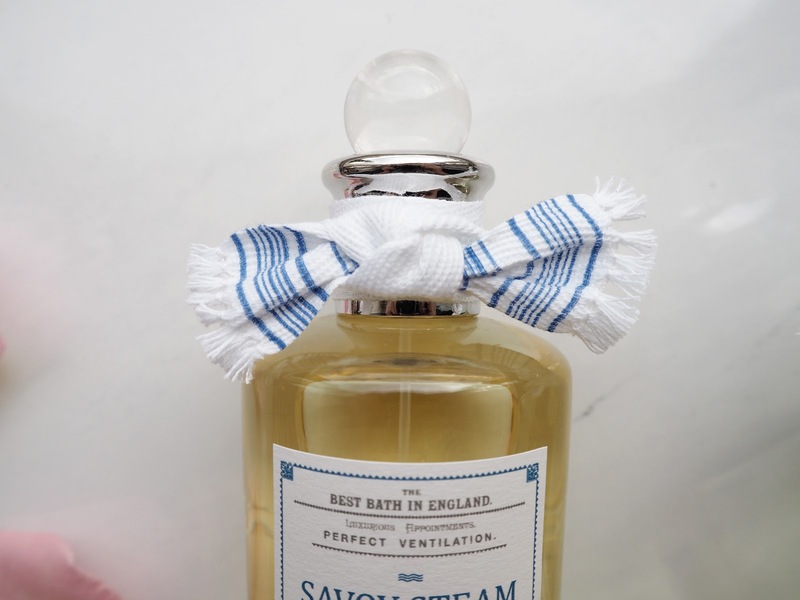 Savoy Steam Eau de Cologne (my personal favourite of the two) retails at £147 for 200ml and can be used as either a perfume or a splash, which is applied to the body after bathing - much like a Turkish Bathhouse ritual. 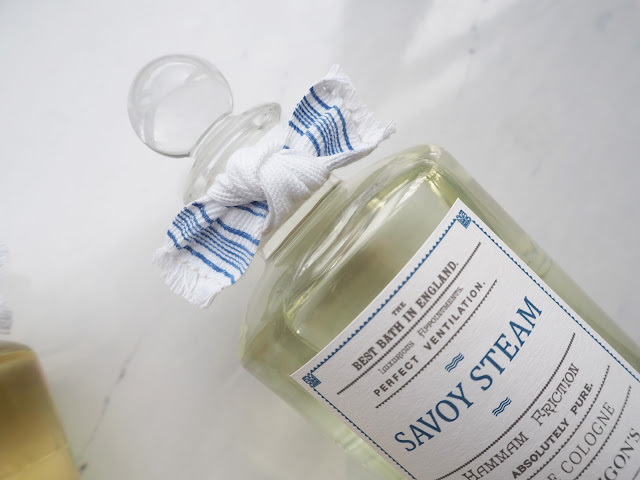 To me, this version of Savoy Steam almost smells like a gin and tonic which is coincidentally, my favourite tipple! To me, this is a slightly more feminine version of the fragrance because of it's slightly fresher, lighter scent. The head notes: Lemon Primofiore and Bergamot. The heart notes; Eucalyptus Oil, Rosemary Oil Tunisia. The base notes; White Cedarwood Oil and Fir Balsam. 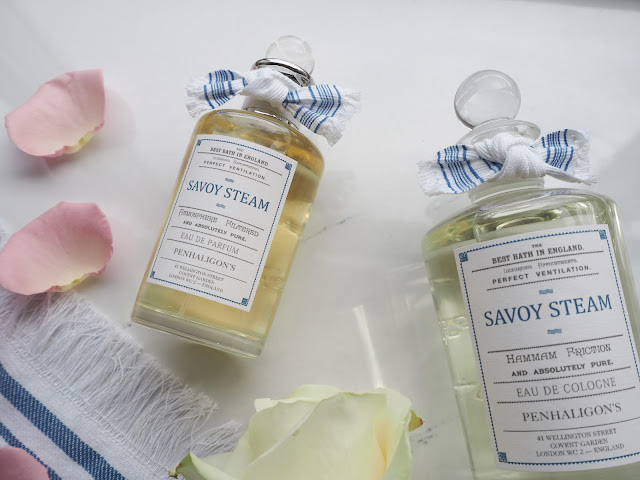 You can take a look at Savoy Steam Eau de Cologne & Savoy Steam Eau de Parfum for yourself here. 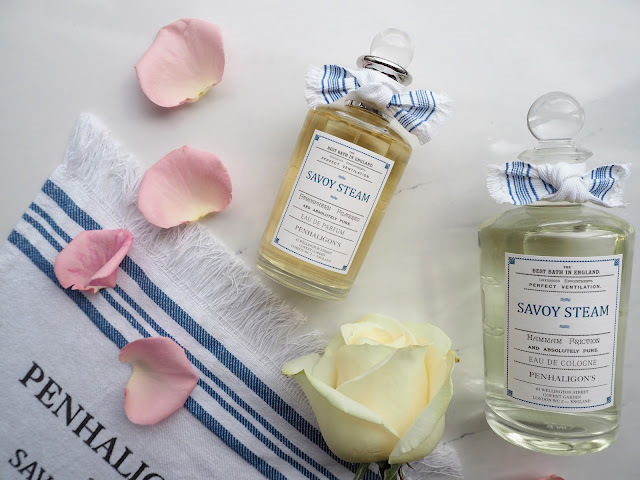 *Please note: this post is kindly sponsored by Penhaligon's - one of my favourite brands!